Top 3 Benefits of Adding Synthetic Grass to Your Home | Turf Etc. First impressions are important, especially for guests and neighbors. 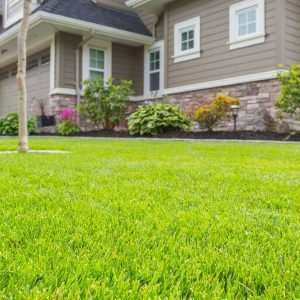 Adding synthetic grass to your Kansas City home can boost curb appeal and impress visitors. With the appearance of lush, green grass, even through the cold winter months, it’s no wonder installing artificial grass has become popular amongst homeowners. Whether you’re creating a picture-perfect front yard, or a backyard oasis, SYNLawn Kansas City can help design a lawn you’ll love. When you bought your home, odds are you looked for something with curb appeal. First impressions can make or break a home, which is why beautiful landscaping is so important. Usually, this begins with the front yard. No one wants to see yellow patches, weeds, or uneven grass in a front yard. When you install artificial grass, you’ll give your home the ‘wow factor’ it’s been missing. Even if you’re not selling your home, this added curb appeal will be the envy of all your neighbors and guests visiting your home. You no longer have to stick to a daily watering schedule to keep your lawn looking its best, which can help you save hundreds on your water bills. Avoid harmful pesticides and fertilizers. These products affect water supply and are also dangerous to kids and pets that play on your lawn. No more fuel emissions. Even just an hour of running your lawn mower can produce harmful gases that pollute the air. Why spend your precious time during the weekend taking care of your lawn when you can enjoy your time spent at home? Homeowners everywhere can agree that spending painstaking hours caring for your yard isn’t the ideal image of fun. Residents of Kansas City have discovered that artificial grass allows them to enjoy more their time with family, friends and pets. Instead of spending hours mowing your lawn, plan a backyard barbeque or invite everyone over for a family event. Don’t worry about foot traffic on your lawn, either. SYNLawn synthetic grass is made to withstand walking and heavy use. Even in winter months facing Kansas City, your home will have a beautiful lawn that can be used year-round. Installing synthetic grass means loving your home again because you’ll have more time to get back to what’s important. Create curb appeal that will be the talk of the neighborhood. Contact us today for a free consultation.